You guys are already well versed with What is IPO? If you have been investing in IPO for quite a time. You might have heard quite often that the Upcoming IPO is quoting at a grey market premium or at a grey market discount. Our today’s post is centered around the IPO grey market. You must be wondering regarding what is the grey market for IPO? or what does the grey market mean? All your desired queries will be sorted through this post. Grey market of IPO is also referred to as IPO gray market. Stay tuned with us till the end to learn about Grey market IPO & Grey market premium of IPO. So without any further adieu let’s get started! What is the Grey Market IPO? What is Grey Market Premium (GMP)? How can investors make the best of the grey market? IPO grey market is the platform where buying and selling are done outside the authorized authority or channels. It is an unofficial way of trading company’s sharer before they are issued in the initial public offering. In other words, the term grey market refers to any type of industry that is operating in questionable legal status. Here are some FAQs on the IPO grey market. Grey Market Premium is something that is easy to understand. It is the premium amount at which shares and application are bought and sold before they are available on the stock exchange. The IPO market is streaming at high today. The NSE and BSE IPO grey market premium has a significant role in determining the subscription. Dear Friends the grey market premium is an over the counter or unofficial market. Here the new shares or the shares of the company bringing the IPO are bought and sold even before their listing on any of the exchange. In fact, the grey market assists in price discovery of the stock. The premium can be positive and negative depending on the demand and supply of shares. If the premium is high, more investors will apply for IPO. On the other hand, if the premium is low or negative, fewer investors will apply for the IPO. Here, we will take two different situations. The fluctuation in the premium keeps on happening.Until the shares are listed for trading on the exchange, action in grey market premium price continues. In addition, an investor can also take the delivery of shares by purchasing the shares of the IPO company on the listing day. Is the Grey market a part of the IPO market? The grey market is an unofficial market whereas on the other hand IPO is the authorized and recognized medium of raising funds in the market within the SEBI guidelines. So the IPO market and the IPO grey market do not have any official relationship. You must be well known regarding what is IPO but it is also very important to know about the grey market in IPO. Why do IPOs trade in the grey market before listing? Firstly, I would like to tell you that the grey market is not an official platform where interested traders can bid and offer shares of the forthcoming IPO. These are not actual shares of the IPO But something like unofficial towards the IPO. A kostak rate is an amount which one pays for the IPO before the IPO is actually listed on the stock market. It is a premium one gets by selling the IPO in the grey market. It is a colloquial word for prices of an application before the actual issue or the allotment. Minor difference between Kostak and GMP. The rate at which one gets premium by selling his/her shares which are allotted in IPO application in the grey market is called Kostak. The premium which is generated in this Grey market by this trading is called GMP (Grey Market Premium). GMP is useful to estimate the opening price of the IPO while listing. What is Subject to sauda? If someone buys an IPO on the subject to sauda price this means they will get the said amount In this one cannot fix their profit as it depends on the allotment. Again if one get an allotment and he or she sold the application around Rs.10000 and the profit goes high on listing day around Rs.15000 then one should pay Rs.5000 to the guy who bought the application. In simpler words, it is a kind of deal in IPO grey market in India. Unofficially, an investor can sell an IPO Application to a buyer at an agreed price (Kostak Rate) before IPO Shares are listed in the stock market. If the seller gets an allotment, he will get Rs 5000.
Who all are the interested parties in the grey market? IPO financiers– The grey market provides them an idea regarding whether the financing in IPO is a lucrative business proposal. Does SBI regulate the grey market? As stated above, the Grey market is not an official platform that operates outside the ambit of the SEBI regulation. Any trade, transaction or bid done under the grey market is not authorized or approved of the regulator or any of the stock exchanges. The grey market is an unofficial trading platform which operates outside the purviews of the SEBI regulation. Hence all transaction is in the form of the forward transaction and is exposed to the counterparty risks and uncertainty. At best, one can consider the grey market price as an indicator of the listing price. It is advised that do not take the (GMP) grey market too seriously, as such a grey market are subject to the manipulation. We don’t trade into the grey market nor do we facilitate buying or selling of IPO forms. IPO GMP is the rate of premium an IPO commands per share in the grey market. 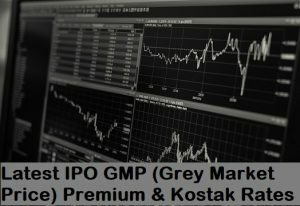 Kostak rate is the amount an investor gets by selling his/her IPO application in the grey market. This is the amount an investor stands to gain, irrespective of allotment status. kostak rates are the premium one gets by selling his her IPO application to someone else before allotment or listed. A gray market transaction involves the unofficial agreement between the IPO investor and a stockbroker which permits an investor to lock profits before the stock lists. Under this system shares allotted to the IPO, an application is sold by the broker without transferring the shares into their account. Since it is an unwritten accord between the two parties, it solely depends upon the trust between the broker and the investor. Just like the stock market and the commodity market trading, IPO grey market premium is decided on the basis of demand and supply. If there is more buyers than seller the prices goes up and vice versa. It is to be noted that there are no regulatory bodies included in the grey market trading and therefore, there is no restriction on price momentum. It may rise or fall suddenly. Q How the grey market works? Investor apply for shares through an IPO. There is financial risk involved with these as they may not get any allocated share or they may receive the shares that may list below the issue price. there are few other people in the market who believe that share value more than the issue price. >If shares are allocated to the sold application, either seller may get call from the dealer to sell them at certain price or to transfer allocated shares to some demat account. In case of selling the shares, settlement is done based on the profit or loss. If no shares are allocated to the sellers the deal is over without any settlement. The seller still gets his premium as he sold his application. Investor applies for the shares through an IPO. They take a financial risk as there is the likelihood that they may not get allocated any share or they receive the shares but shares may list below the issue price. Let’s call them ‘Sellers’. There are few other people in the market who think that the share values more than its issue price. They start collecting these shares through grey market dealers much before the shares are even allocated. Let’s call then ‘Buyers’. Buyers decide the price of the application based in various assumptions and market conditions. They give an offer to the sellers that they are willing to buy an IPO Application (without knowing how many shares will get allocated) at a certain premium. To avoid the risk of allocation seller may sell their application at a certain premium to the buyer through a grey market dealer. This kind of trading is call application trading or ‘kostak’. In case of ‘Kostak’ seller need not to worry about the share allotment in IPO. He receives the allotment or not he will get the premium at which he sold his IPO allocation. Grey market dealer get the application detail from the seller and send a notification to the buyer that he bought an IPO application at a certain premium from the sellers in grey market. The allotment is done by the issuing registrar. The application seller sold may or may not receive an allotment of shares. If shares are allocated to the sold application, either seller may get call from the dealer to sell them at a certain price or to transfer allocated shares to some demat account. In the case of selling the shares, the settlement is done based on the profit or loss. If no shares are allocated to the sellers the deal is terminated without any settlement. The seller still receives his premium as he sold his application. Q How come grey market fluctuates every day? Grey market fluctuates like the listed stock price. It is based on demand and supply. More buyers than the seller will augment the grey market premium, while more seller than the buyer can pull it down. Q From where can I know the present rates of premium on a share in an IPO grey market? Based on the demand and supply of the company of the IPO of the company, it can be positive or negative. Q Who pays the brokerage when selling shares on a listing day in the grey market transaction? Clients who alloted the shares and sold on the day have to pay the brokerage. That’s why it is significant to open an account with the discount broker. Q Should IPO investors consider grey market premium before applying in an IPO? Yes, the investors can consider it as one of the parameters before applying for the IPO stocks. It is to be noted that grey market premium does not guarantee for listing gains or long term gains. Grey market premium may change in the duration when you apply for IPO and when the issue gets listed. I hope you had a great time reading about the “IPO grey market premium”. If you like it please do share it among friends and colleagues via Facebook and Twitter. I hope you find the information regarding the Grey market India useful. Also, write to us if you have any queries pertaining to this post. We at investor academy aims at delivering quality information to the readers. Next articleDifference Direct Vs Regular Plan Mutual Fund Investment- Which one is better?